Taking its cue from William Castle's 1965 thriller I SAW WHAT YOU DID, THE GOOD NEIGHBOR presents yet another tale of a teenage prank gone bad. It's not a remake or rip-off, mind you, but there's no denying a spiritual connection between the films. The story begins with Ethan (Logan Miller) and Sean (Keir Gilchrist) relating their plan to convince their reclusive neighbor Harold (James Caan) that his house is haunted, recording the entire process on hidden cameras. Of course they first have to break into the guy's house and plant the equipment. Did I mention this was also for a school project? The kids may be computer and tech savvy, but they clearly weren't using their heads to think through the possible legal ramifications. Nonetheless, the kids do manage to get things set up. But no matter how much they escalate the fake haunting, Harold seems to take it all in stride. Ethan in particular is bothered by the lack of response, and eventually we learn that his reasons for targeting his neighbor are more personal than just his reputation as a creepy old man. It also becomes evident early on that we're seeing Ethan and Sean's prank in flashback. In the present, a trial is taking place, evidently precipitated by the prank. But we aren't sure at first whether it's Harold on trial, or Ethan and Sean. Nor do we know what crime was committed. We do get our answers eventually, but things take an unexpected twist before all the loose ends are wrapped up. 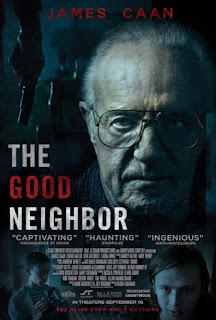 On paper, the plot of THE GOOD NEIGHBOR is a smart, reasonably well written mystery/suspense yarn. The cast is good, too, with Caan in particular doing quite a lot with almost no lines. Unfortunately, Kasra Farahani's direction is flat and unengaging, never raising our heart rates or rousing us to move to the edge of our seats. Outside of an extended scene that takes place at a Halloween party, this feels more like an episode of 'Law and Order' than the sort of thriller you'd release in the fall to target thrill and chill seeking audiences. 2 out of 4 stars.